A design study was initiated and several engineering design layouts were performed to optimize the new connecting rod profile. There were two objectives for this initial design study. The first was to provide the largest possible big end bearing on the connecting rod while maintaining stock crankshaft stroke (4.250 inch); stock connecting rod length (7.500 inch) and not having the connecting rod big end interfere with the camshaft, inner walls of the crankcase, or oil pan. The second objective of this initial study was to maximize the width of the connecting rod column (cross section between big and small ends) to maximize column strength. From this initial study and layouts, an accurate full-scale model with moving components was constructed out of acrylic plastic to dynamically demonstrate validity of the profile. 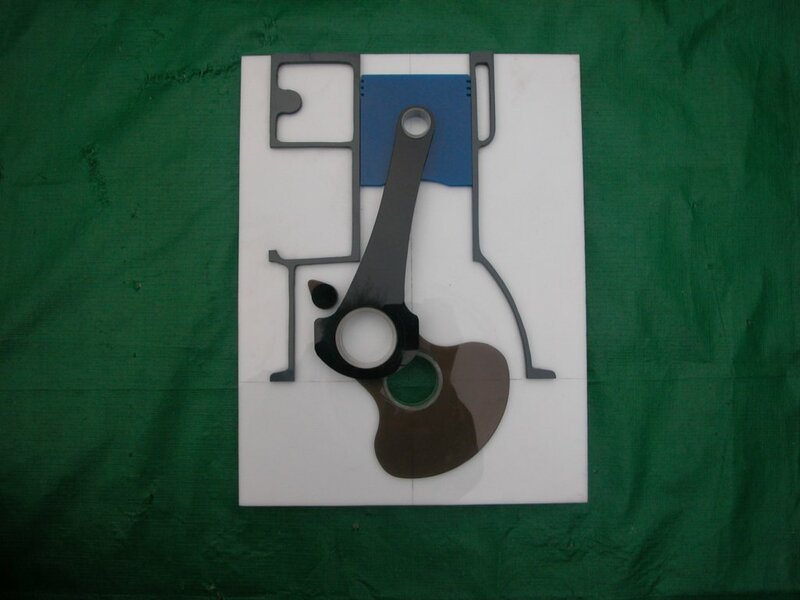 Figure 2 is a photograph showing the acrylic model. 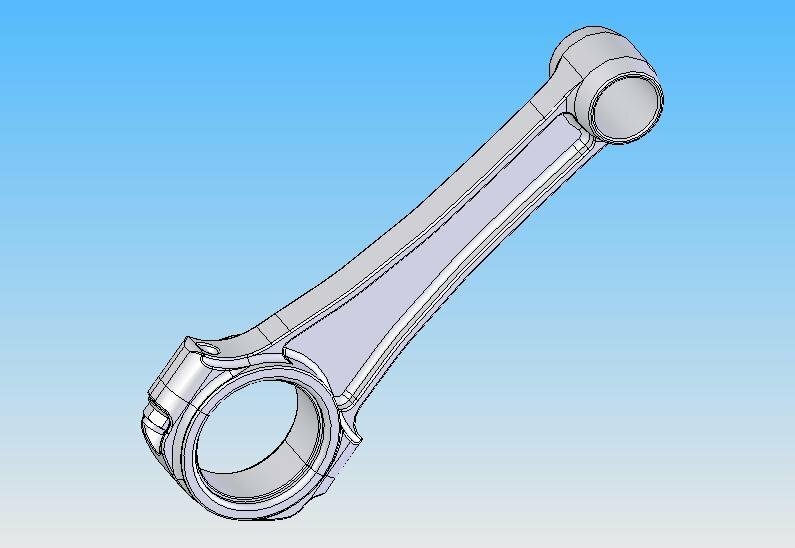 Although it appears that the cam lobe will hit the connecting rod in the model, in reality the lobes are fore and aft of the connecting rod, and the only clearance issue is with the base circle of the camshaft. The new connecting rod big end bearing is 2.000 inch diameter and the width of the big end of the connecting rod is 1.120 inch. The bearing insert is a Federal Mogul part # 2020CP that has been used in a connecting rod application in a variety of General Motor’s 4, 6, and 8 cylinder engines produced from 1955 until 2002. Replacement inserts are readily available, economical, available in many under sizes, available in many configurations depending on application, and should be available for many years to come. This bearing insert is also available in heavy-duty configurations for severe loading (Clevite 77, basic part # CB-745), and from many other manufacturers. One of the original applications for this bearing is in a small block Chevrolet V8. Bearing insert loads in the new connecting rod of this study are similar to loads found in a small block V8 engine producing 300 HP at 5000 RPM. This re-engineered Model A engine has being engineered for 150 HP at the same 5000 RPM with half as many cylinders, so horsepower per cylinder is identical. The connecting rod big end of this re-engineered engine is split on an angle of 76 degrees from vertical. This angular split was necessary to accommodate the 2.000 in. diameter big end bearing while maintaining clearance between the big end profile, camshaft, and cylinder walls. Precision studs with dowel pin accuracy are threaded into the upper rod half to provide accurate cap alignment. Both ends of these studs are accessible on assembly, so a micrometer can be used to measure stretch, which is the preferred method of measuring fastener preload. The cap is attached with a pair of MS21042-6 nuts. The width of the upper end of the new connecting is equivalent to a stock rod and accepts the same pair of wrist pin bushings (Federal Mogul 8229X) found in a stock connecting rod. Figure 3 is a computer generated solid model of the redesigned connecting rod. Connecting rods are subject to tension and compression loads. The compressive load is gradually applied as the fuel burns and occurs over a period of time (power stroke), however the tension load is very severe and sudden (like an impact). In a normally aspirated engine, peak tension loads are usually much greater than compression loads. That is why race engine mechanics often speak of connecting rods stretching. Tension loads are due to piston acceleration. Maximum connecting rod tension loading occurs at TDC at the end of the exhaust stroke and beginning of intake stroke when the connecting rod has to stop and then change the direction of the piston (Crank angle at 0 or 360 degrees). This is the load that stretches the connecting rod, causes the big end to become oval, and pulls at the fasteners. The acceleration load G expressed in g’s can be approximated at any crank angle from the following equation, which can be found in many handbooks. When solving the above equation, positive results (+ g’s) will cause tension loads and negative results (-g’s) will cause compression loads in the connecting rod. Solving the equation at TDC (0 or 360 degrees where cos a = 1, and cos 2a = 1) and 5000 RPM, the acceleration G is +1936 g’s. For stress calculation purposes (and a sample calculation), assume that the connecting rod is going to fracture right across the middle of the wrist pin. The area of the new connecting rod at this fracture plane is .4646 in*2 and has to resist the g loading resulting from the weight of the piston, rings, wrist pin, and upper piece of connecting rod that are all attempting to fracture away. For calculation purposes, the weight of all parts attempting to fracture away is assumed to be 2.00 lbs. (Actual weight of a stock piston, wristpin, and rings is 1.55 lbs.). This worst-case assumption compensates for loads that cannot be accurately calculated such as shock loading, loads resulting from inaccuracies in later rebuilds, and increased loading if a heavier than stock piston is used. With the above assumptions, the force attempting to fracture the small end of the connecting rod at TDC due to cceleration at 5000 RPM is 1936 x 2.00 lbs = 3872 lbs tension. This 3872 lb load is acting on the .4646 in*2 cross sectional area. Stress in the connecting rod at this location is 3872 lbs / .4646 in*2 = 8334 lb/in*2. Therefore, a material with a fatigue endurance limit greater than 8334 lb/in*2 is required. Likewise, the tensile force at the big end of the connecting rod at TDC can be calculated. Here the load is much greater because the part attempting to fracture away also includes the weight of the upper part of the connecting rod. The upper part of the connecting rod weighs 1.136 lbs, so the total load is (2.00 lbs. + 1.136 lbs.) x 1936 = 6071 lbs. This is the load that the two fasteners attaching the cap must endure. Similarly, the g load, stress, and strain at every crank angle and RPM can be calculated at every location on the connecting rod with FEA. This is all done on a computer. FEA results can be displayed on the part being analyzed where different colors represent different amounts of stress or strain. An FEA display looks similar to a weather chart where different temperatures are represented as different colors. Have you ever wondered where the bearing tang notches should be? Modern engine design places them on the same side of the journal to insure that there is no binding in the event that the parting line is not exactly centered on the bore. But what side? Maximum loading occurs at TDC which means the bearing insert half in the connecting rod cap reacts the highest load while at this very instance, the upper bearing insert sees no load. This combined with the direction of rotation of the journal dictates that the notches should be placed on the side closest to valves.